The weather has been extremely dicey for the last few weeks, making it difficult to get the gardening started. The last two days cleared up enough for me to get out there and start clearing away the leaf mulch. 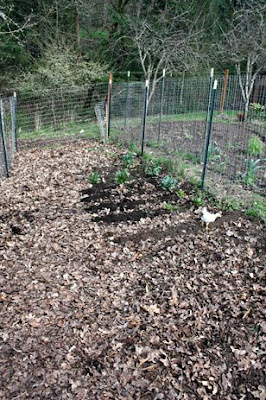 The good news is that mulching deeply with the leaves turned our garden plot into an earthworm factory! Those leaves were full of worms, and what looked to my untrained eye like a ton of earthworm eggs. They look like red wrigglers, the same time of worms used in vermiculture (otherwise known as worm composting). I have been letting the baby chickens come into the garden plot with me, since it gets them outside and they're still too small to go in with the big chickens yet. They're having a good time learning to scratch, and eating small weeds and bugs. Thankfully they aren't big enough to eat my nice composting worms yet, so I'm fine with them roaming around the garden with me. A couple of years ago, we removed a pile of gravel from near our current garden plot only to find the biggest earthworms I'd ever seen under there. They were easily a foot long, and though they don't come anywhere near approaching the size of the possibly-extinct Oregon Giant Earthworm, they were huge enough to impress the heck out of the kids and adults alike. I am always happy to have a thriving earthworm population in and near my garden, and though it drives me husband nuts when he goes running with me I have been known to save them from the pavement in rainstorms or when they get dried out and dehydrated in the summer. On a recent jog together, he had to give me a cutoff point of worm saving, since a recent rain had brought up so many of them that my rescue efforts were slowing us to...well... a worm's pace. Still, it's hard to ignore the value of these lowly creatures. Charles Darwin once measured the quantity of worm castings produced in a year in a field near his home, and found an astonishing eighteen tons per acre. Now don't ask me exactly how he did that (the measuring part), but it's a testament to the productive helpfulness of worms for us gardeners. Darwin studied worms for almost 40 years and helped bring them to light as garden allies instead of the pests they had been assumed to be. And if you don't think worms can get really cool, check out Australia's Giant Blue Earthworm. Up to six feet long, with luminescent mucin, and very very bright blue, worms just don't get much cooler than this. We're all loving the return of daylight savings time here, more hours in the evening to be outside. The weather has been stormy/rainy/windy/hail/sleet/cold though so I have to admit I've gotten absolutely nothing done in the garden. Somehow I'm just not motivated to go out in all of that! Our little peepers are growing like weeds, and our older lady hens are starting to ramp up egg production again. It's easy to see why both pagan and religious holidays tend to center around the spring equinox with everything budding, blooming, growing, and being born. Around Casa Blue Skies, Wayne has become King DIY. He has added to his homemade bread-baking repertoir with brewing beer and this week he started some kombucha. I've been making yogurt, and just got the supplies to make hummous (a family staple) out of the dried local transitional organic garbanzo beans I bought last fall. Making that at home would save us money and save the environment from all those little plastic containers. The economic woes still feel like the sword of Damocles (which has given us a couple of good pokes but hasn't fallen yet), but so far we're just trying to ignore that and focus on the things we can be doing, moving forward. Jeepers, Where'd You Get Those Peepers?? So my hubby likes to think he's really the harcore parent, the tough guy, the got-it-all-under-control dude. But every now and then something happens that shows the real softie that's lurking underneath that tough exterior. 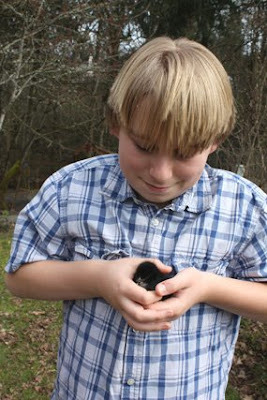 Such as going to the feed and seed store with Asa the other day to get some chicken food. Of course, it's Cute Little Fluffy Peeping Chick season at the Feed-n-Seed in March, so Asa loves to go in and look at the little fluffballs. But this time there was only one lonely chick left in the place. One terribly lonely chick. Peeping its little heart out in its sad sad state. So of course, being the animal lover that she is, she couldn't just leave it there. And hubby, being the softie that he really truly is, couldn't let that happen either. So home came the chick and out came the heat lamp, the watering dish, and the small cage. 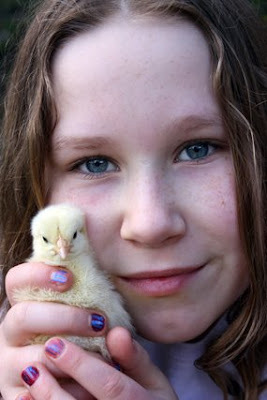 Meet Gloria Peeper, the not-so-lonely chick. 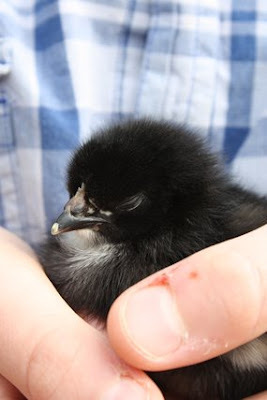 But the problem with getting one little chick is that it was still terribly lonely. It stopped its plaintive peeping only when Asa was sitting right next to the cage talking to it. She lobbied to sleep in the garage next to the cage, but we finally hit on the idea of putting the cage out in the chicken coop where Gloria could hear and see the big chickens. This seemed to comfort her immensely and she finally calmed down. Still, it's not a good idea to try to introduce one new chicken into an established flock, not to mention the fact that big brother Mackenzie was now lobbying for a spring chick of his own so on Wednesday we went off to the Feed-n-Seed again (knowing that Wednesday is when they get the shipment of new chicks in). So meet Shadow, Mackenzie new baby. She's much smaller than Gloria since she was born a week later, but they seem to have hit it off and are snuggling up together under the heat lamp. All is well at the Blue Skies Ranch, and although we didn't mean to add any new chicks to the flock this year, everyone is enjoying having the spring chicks around. Shadow is mellow and quiet, likely to go to sleep in your hands. She'll be an all-black chicken. We believe that Gloria is a Delaware, so she should turn out white with some barred markings, but we won't know for sure until she gets bigger since it was a mixed bunch in there and she was the only one left. For the last couple of years, we've been getting goat's milk from a local couple who live in the farmland around town and keep a few goats. With our kids both allergic to cow's milk, and a belief that raw milk is much healthier than the pasteurized, homogenized stuff in grocery stores, we've been really grateful to have a weekly supply of fresh and tasty real milk straight from the goat! Two weeks ago Asa asked if she could start learning how to milk the goats, so Wayne has taken her out to their farm on the last couple of Saturday mornings and she's been doing some milking. This Saturday they got one whole goat milked between the two of them. Wayne had a head start being as he worked on a cow dairy in his teenage years, but Asa has the advantage of being a quick learner and absolutely adoring every animal she meets. I think it's awesome that they took the time to show her how to do this - talk about knowing where your food comes from! And also that in case they ever need to leave town, they've got one more backup milker they can call on to cover the goats. And Asa has a head start on the skills she'll need when she eventually lives on the farm/menagerie of her dreams that she's planning. To me, it's one more reason to build those vital connections between the food on your table and the places it comes from - whether its your own garden, a CSA box from a local farm, going out to pick berries locally and chatting with the owners, or milking a goat. Making those connections brings our world a little closer, let's us understand the food web that we are a part of and how our actions relate to the availability of fresh and wholesome food. Also, it's nice to make new friends and bridge the gap between the towns we may live in and the countryside around us.